Unofficial Cardboard is a producer of Google Cardboard solutions specializing in Custom Branded VR viewers. Matterport recommends Unofficial Cardboard for Matterport Service Partners (MSPs), realtors and VR enthusiasts who are searching for customizable Google Cardboard VR viewers to use with Matterport VR. Unofficial Cardboard makes it super easy to pick the images you want to feature and add your branding and logo. The VR experience has now been made super easy. Simply use a smartphone to view Matterport VR content with these VR viewers. Unofficial Cardboard is a WWGC (works with google cardboard) certified manufacturer. 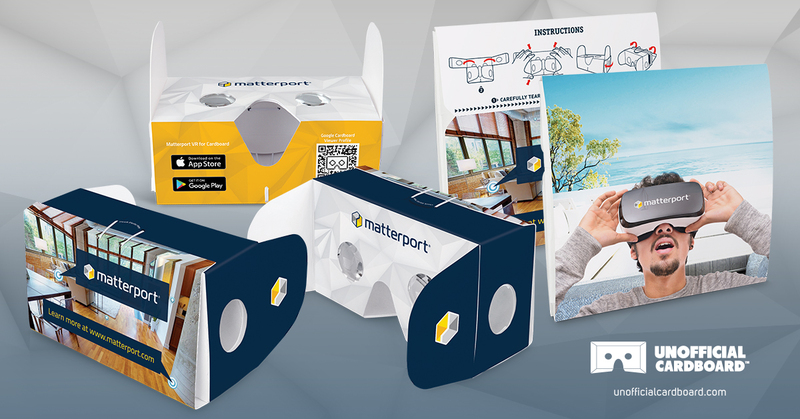 Special Discount for Matterport customers: Get 15% off any Unofficial Cardboard products by using the coupon code MPDiscount . *Purchase as few as 20 viewers for as low as $9.95 each.